3D printer improvements: 3D printer survival kit: a comprehensive set of 3D printer tools and tips. 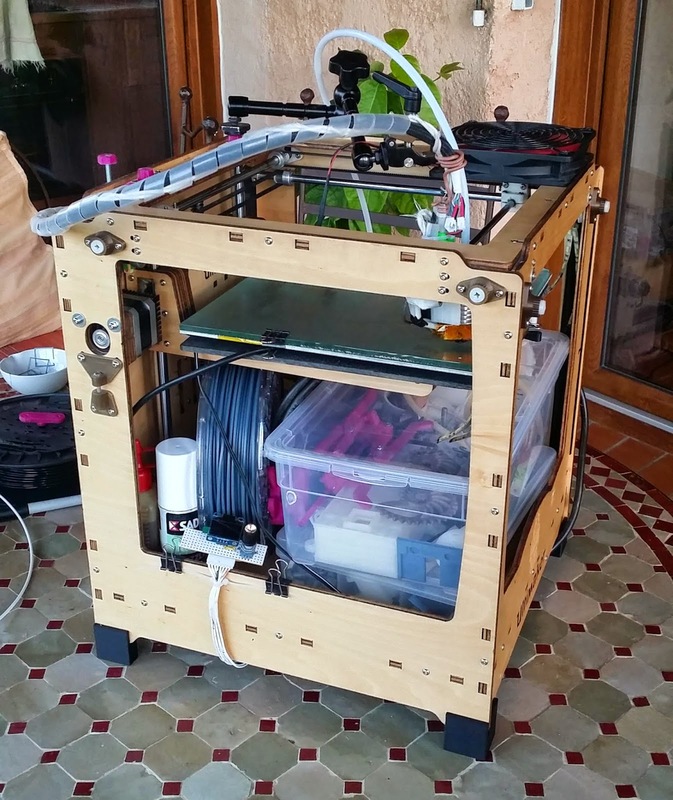 3D printer survival kit: a comprehensive set of 3D printer tools and tips. This post started as early as September 2013, and it eventually ends here, may 2015! At least, you can be sure I heavily made my opinion and I have feedback on the tools I list here. All included, a nicely packed Ultimaker 100% ready for travel. I keep nearly all my tools in a dedicated box, that matches well the bottom of my printer. You will read in this post about each of the tools, slightly sorted in different categories and even though some tools are used for multiple tasks. Telfon tape (3/5) is mostly interesting when assembling the hot end, in order to seal it against PLA leaks. But take care, as teflon is no good above 250°C. When assembled tightly and with quality stuff, no seal really is needed. The initial brown liquid will eventually seal it completely. I still keep a small roll of Teflon (bought for plumbing affairs), according to the hot ends I swap and filament I print. One large roll of Kapton (2/5). Everyone knows that this very special adhesive band is used on the bed to improve adhesion of the first layers. In this case a large roll is better (50+ mm). Extra large rolls (150mm) are interesting but too large to keep within reach. In fact I never use Kapton on my bed, mostly because mine is heated and I use glue (see below). Kapton gets torn soon or later and it is annoying to replace. is perfect to insulate the hot end (and your fingers). After more than one year using it, I find Kapton is most suited to insulate the hot end: it keeps the temperature stable even when fans start blowing toward it. And it gives me time to retract my fingers before I burn myself (compared to raw aluminum that conduct heat much faster!). It also prevents the leaked goo to end on your parts! For this purpose, I found that a thinner roll of Kapton (4/5) that is only 10mm-15mm wide makes life much easier than a large one. Anyhow, beware of cheap Kapton that does not stick well (sometimes sold as knock-off "Koptan"!). Note that some people embed the hot end nicely with better and thicker material such as glass-insulated tape (4/5), but it becomes cumbersome to swap nozzles or hot ends afterwards, so it may be good if you never change them. A basic lighter (5/5) is a must. I use it very often to "round" the head of the filament before I run it through the hot end. This is the easiest way to make it thin enough, but also to prevent inside damage to the bowden tube when it has sharp "snapped" edges (PLA may strip thin bands of PTFE, that will block your nozzle badly). 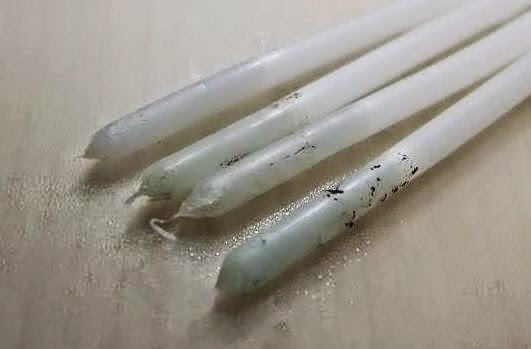 A blowtorch (2/5) is so powerful that it melts the filament instantly, and then burns you when you flatten/burr it with bare hands. A lighter gives enough time to get the proper viscosity. Sure, the best tool here is a hot air rework/soldering station as you can set the exact temperature target, but it is totally bulky. Note that a lighter also helps shape hooks on the fly, e.g. to prevent your bowden tube from rubbing against the printer, to release strain on cables and so. PLA snaps a bit too easily in this regard, favor ABS. To clean the head, I do not recommend thin wire (2/5) as it may ruin the nozzle (check the proper size here). It helps only when you nozzle is completely clogged with hard carbon. Always keeping a cheap piece of nylon trimming line (5/5) is the real best way to "fish" PLA/ABS dirt out of the nozzle. A big rounded nail (2/5) very rarely helps to push the other way (it depends on your hot end, check my old post on the matter). With my metal hots ends I no more have such problems. A small flask of alcohol (3/5) to clean the bed -- no need to try beer (0/5). Actually, I often prefer almost undiluted dish washing soap (4/5). Rinse and repeat until you get a thicker foam on the bed, which means no trace of grease subsists. I do it rarely, as liquid glue is so efficient, unless I want to wash it off to revert to a pristine (sanded) glass bed for the neatest PLA prints. Some people use a lot of blue painter tape (3/5) to improve bed adhesion, but I don't like it as it needs to be changed often, and it leaves tiny bits of fibers in the bottom of the prints. Cyanoacrylate is only for extreme fixes on the fly. Alcohol mat not be better than thick soap though. Solvent-free liquid glue (5/5) is the killer in my opinion. I really was using this exclusively and consistently for almost two years now. I often add a bit of water to dilute the liquid glue further, even when printing annoying Nylon. Comparatively, I do not recommend glue sticks (3/5), as they leave annoying blobs of glue that need to be watered/flattened afterwards. I do not like sprayed glue (2/5), as it is not economical, nor ecological, and the mechanical parts will eventually collect some glue also (very bad!). Still OK when you can detach your bed (but still not really economical imho). Automotive thickness gauges (1/5) are useful only if you feel the need to know exactly how much gap you left between your nozzle and the bed. Actually I have a pretty reliable idea of "how much" by the eye and enough experience I guess. And, oh, a pen or marker and sticker notes (4/5) is very helpful. It is often needed to write down and remember settings and comments for the many filament kinds you may own. Once properly tuned, I re-write them in a private wiki page. But a marker or a small pen is always useful, just to give your email or website to someone (by the way, I also attached a small small box to hold a few visit cards). Powerful light source and powerful magnifier are a must. A magnifier glass (5/5), preferably with a high power is a must to check your prints. Keep it small, or print your own handle, as you will not always have the space around the head to check the the deposited layers. Together with a spot, or less bulky powerful light torch (4/5), a magnifier is an invaluable tool to learn and fine tune your printer. As you can see on the left and below, I use a high end x12 microscopic lens for digital camera (overkill), and a 3D printed handle made out of flexible PLA. This way I can stick the magnifier and get the proper angle to check the first layers, while illuminating the print from the other side (for the maximum light reflection). Here is the self-made handle for my high-quality magnifier. My use of super glue (4/5), aka cyanoacrylate, is mostly restricted to "hot fix" stubborn warping. It also helps to repair cracked printer parts on last resort like a small gear (in which case it becomes compulsory if you have no spare!). I really miss strong paper towel (4/5) when I forget it, as I very often I wipe the head with it, before I start printing directly on it. Then I slide the paper with the head toward the actual start of the print while pulling any ooze away. Long and flat tweezers (2/5) are useful to grab those damn little screws that fell in the darkest corners of the printer. 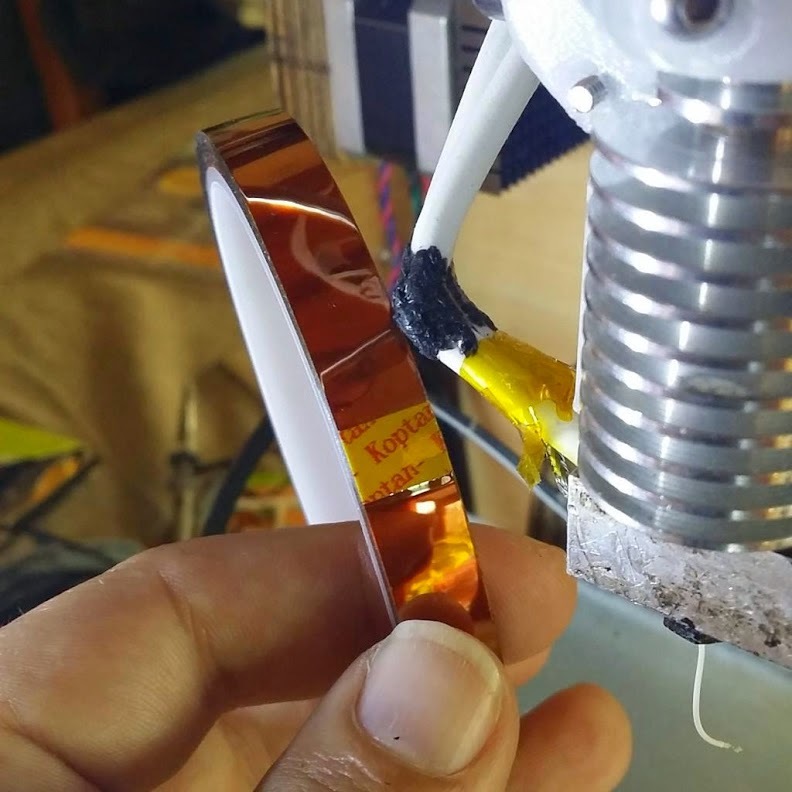 Some use it to grab the oozed filament, though I had been doing it with my bare fingers without burning myself for years (OK, almost never burnt myself -- check kapton above). against warping and to maintain a flat top during tricky prints. Possibly a clamp (1/5) to fight warping as shown on the left. But when you revert to this, your print is probably ruined anyhow! It may help to secure a cable but it is bulky. A long, flat aluminum tab (4/5), to help cooling corners quickly, especially when you have no "local" fan as I have. It is always weird to me how efficient it is. I gave it some curve to help me keep the top part of a tricky print flat and cooler. Generally unused until you need it! Deluxe cheese knife as a removal tool (overkill), and a blade holder as a scraper (see text). Much better and safer than any naked cutter blade. Large flat knife (2/5) to use as a lever, or, better, a wide scalpel holder (4/5) to help removing the sticked prints off the bed. But better dose the glue appropriately (no need for PLA!). The wide blade is also very useful to remove dried or dirty glue off the bed. Use of sharp cutting tools is compulsory at one moment or another. The best are definitely scalpels (5/5) in my opinion, with one curved blade and another with a thin and straight one. They cost nothing on ebay, and there are sets of 10 blades of many shapes. Scalpels are also useful to remove specks of plastics that remains on the bed, without removing too much glue. Three tools for three different deburring jobs. Using the proper tool is a joy in itself. I do not like X-Acto knives because they are bulkier (and more expensive). Most "snap-off blade" utility knives are both dangerous and inefficient in my opinion. but the right one is useless. A manual drill (4/5), which handle you can print yourself. Or, a more expensive reamer (1/5), that will suit many more sizes. Better get one long and thin one to have a very sharp angle and make almost non-conic holes. There are also bigger tools to chamfer holes (2/5), like the big one on the right. They are are useful, but you may want to check for 45° chamfer wood end mill, as they will use less space in the toolbox. In any case, I think that manual tools let you do a much cleaner job compared to power tools when dealing with thermoplastics. Of course, you will probably want also to have some taps (3/5) and corresponding drill bits. Now, most of the time it may be done with the help of a regular long screw and fast forward-reverse movements. A set of good set of small files (3/5) are really useful. Some can be found very cheap on ebay (e.g. $1.76 here! ), and still give good results as the ones below. They are very useful for printed joins when you need a tight tolerance. Very useful tiny files. A round one and a flat ones are a must to post-process tight joins. Small and useful multi-tool wrench. It cuts Nylon safely. This one is not very comfortable in my hand though. A tiny pair of pliers (3/5) is a must have, and it helps also to snap or cut filaments more easily than anything else (think about Nylon: you cannot break it, and using a scalpel is out of question imho). A set of hex keys (M8 is used in many printers, mostly because of the filament driver bolt). Actually a tiny adujstable wrench (2/5) would be very useful to replace a bunch of 8, 10, 12 flat wrenches, but I did not get anyone good enough so far (crappy sloppy ones from ebay). though I shortened it, I often use my nut calumet instead. A high quality set of hex screwdriver (5/5). Actually, I better recommend a multitool that can hide long bits within the handle, so it takes less place in the box and has more than one size. Pulley allen hex key (5/5), that are rarely used but that are compulsory to secure your pulleys on the axis. 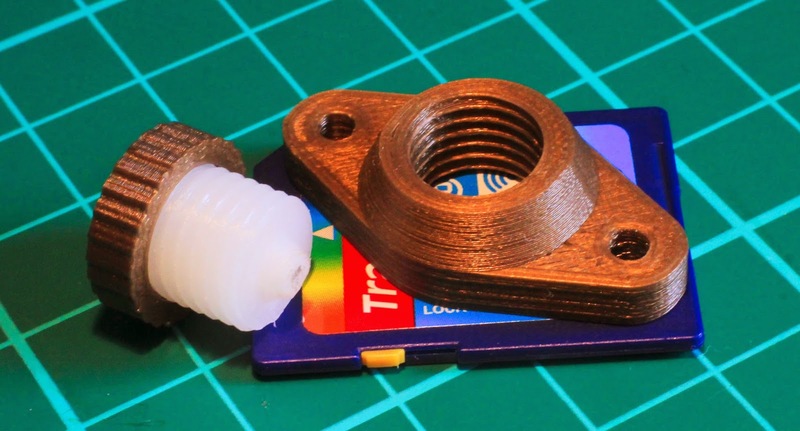 My nut calumet (4/5), as it helps tremendously on the UMO for the rod caps and the nuts within the stock hotend fan... As you can print it it costs nothing and takes no place for what it brings. The top wrench was "widened" specifically for the heater block. This way I can remove it without burning myself. but the cheap ones I tried so far proved to be too cheap. Light/liquid grease for the rods and bearings. Sewing machine oil (5/5) is the simplest and best oil for a 3D printer. Teflon sprays (2/5) are "cleaner" but they do not last enough in my opinion. Thick grease (3/5) is a bad idea, even though they may be used nicely for the Z axis (and only there, please!). A very small flat screwdriver (?/5) will help you tune the tiny potentiometer on some Pololu drivers. Some people recommend ceramic (non-conductive) screwdrivers, but I find it works as well with a regular one. It may become a must only if you want to fiddle with the stepper power (e.g. to try and print faster). Miscellaneous electric ties (4/5): small ones keep the electric cabling tidy, and large ones help routing the bigger cable and bowden tubes to the head. Some of them can be adjusted and re-opened, which is very convenient for the latter case. I always have some at hand. I often use scratch-like ties. Spare gears (3/5) for the filament driver (though they they eventually break at the worst moment). One more stepper driver (1/5) and RAMPS board (1/5) if you really want to make sure you can print when you want to print. One power supply block (2/5), as it breaks more often than expected. Obviously a proper set of spare nuts, washers, springs (4/5) for your printers. I also bought a comprehensive set of M3 stainless steel nuts to assemble my designs, as they are also the ones used to assemble the printer itself. More tools and spare parts. I printed the small box for the set of screws, nuts and washer. I usually also have a spare filament driver and almost one full hot end, but this is luxury. The zip-ties and piece of nylon are very really useful though. It is tiny enough to be kept with the tools, so you always have it handy. And always... I keep a carefully selected set of tiny but high quality printed samples (4/5) to brag about. In my case, my printer is probably enough as many parts were already re-designed. The tool/dirt box (5/5) itself: it holds all the tools, and in my case it fits nicely the bottom of my Ultimaker, so it makes it very easy to drag around in only one piece (given that I also moved my power supply beneath the frame). Also, I eventually bought some tools twice. Now I have one set specifically for my 3D printer work. I realized more than once that I had left THE required tool/fix at home just when I needed it badly on a trip with my printer to a friend or to a client. The worst was when I did not have the spring for the level of my filament feeder (I had to revert to electric ties... and it worked! At least I had electric ties). A good set of tools really helps with 3D printers. Good tools help not only to fix problems more efficiently, but also to clean prints better than with the too common "basic" household stuff. What is nice is that the proper tool for the proper job is not necessarily expensive nowadays: most of these here were bought on ebay or at the local shop for a few bucks. with the help of a scalpel, equipped with a straight blade.